With so much talk of the polar vortex making a return this winter, it’s no surprise that more people are heading south to escape the cold weather. 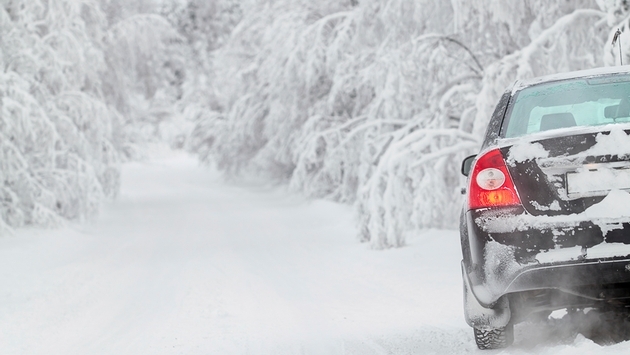 When planning your upcoming winter road trip, there are a few safety tips to keep in mind. It’s important to expect the unexpected and plan for all situations. Several years ago we set out during spring break for some sunny California weather. Expecting the winter season to be over, we headed south with a bag full of sunblock and bikinis… and found ourselves in the middle of a snowstorm along Grants Pass in Oregon. We were definitely not prepared for this sort of weather, and if we had car troubles along the way, we had no winter gear with us to survive. Luckily we made it to California with no problems and were able to enjoy our road trip adventures, but we learned a great lesson that year. • Check the weather before you leave, but know that storms can roll in pretty quick. • Travel with warm blankets in case you find yourself in a situation where you need to keep warm overnight waiting for help to arrive. • Travel with at least two days’ worth of food and water, especially when traveling long distances or over mountain ranges. • Travel with chains, a spare tire and road flares. We never used to travel with road flares, but always travel with glow sticks for the fun of it. We’ve had to use our glow sticks several times for various safety reasons. We now travel with road flares. • Travel with a map. We always travel with a GPS, but there are times where our GPS doesn’t pick up a satellite signal due to the area we’re in. • Make sure to tell someone where you are going, and when you expect to be back. • Use your road sense, keep a safe distance between you and the car in front of you, and when it’s snowing out be extra cautious. We love traveling at night time, as this helps us avoid rush hour traffic, but night driving brings its own set of problems during the winter months. Be careful on roads that haven’t been de-iced/plowed yet, as there could be black ice under fresh snow on the roads. In one of my previous blogs, I touched on some essential apps for road trippers. During the winter months, the weather app is a great app to have on your phone. It’s a good idea to check the weather of some of your upcoming destinations to make sure you’re not heading into a snow storm. Waze is also a great app for winter road conditions as it provides real time traffic updates, and can alert you to any accidents or highway closures. Orbitz is also a great app for if you find yourself stranded in a town due to snow and need to book a hotel stay. Road trip tip: We often find it cheaper to book on Orbitz than directly through the hotel. We generally use the hotel’s free Wi-Fi to book our rooms, and then check in at the front desk. This is a great way to save money. Are you heading off on any winter road trips? Leave your comment below and let us know where you’re heading.